It may be your sister. Your wife. Your girlfriend. Your best friend. Your work colleagues. 1 in 10 women will battle this debilitating disease, so you are bound to know someone with it. You may not even know that they have it. You might be reading this going “I’ve got it, I’m an Endo Warrior!” It’s a mystery to so many and has NO CURE. Help the 10% of Canberra women suffering in silence and raise money for research and education for Endometriosis. Endo is when the tissue that is similar to the lining of the uterus (womb) occurs outside this layer. Symptoms include fatigue, pain that stops you on or around your period, pain during ovulation or those intimate moment with your partner. Pain can be experience in your pelvic region, lower back or legs, anywhere in your body really. It can stop you from getting out of bed, make you nauseous or even black out. From pain, infertility and mental health problems, every woman is effected differently. My battled began at 15 when I got my period. 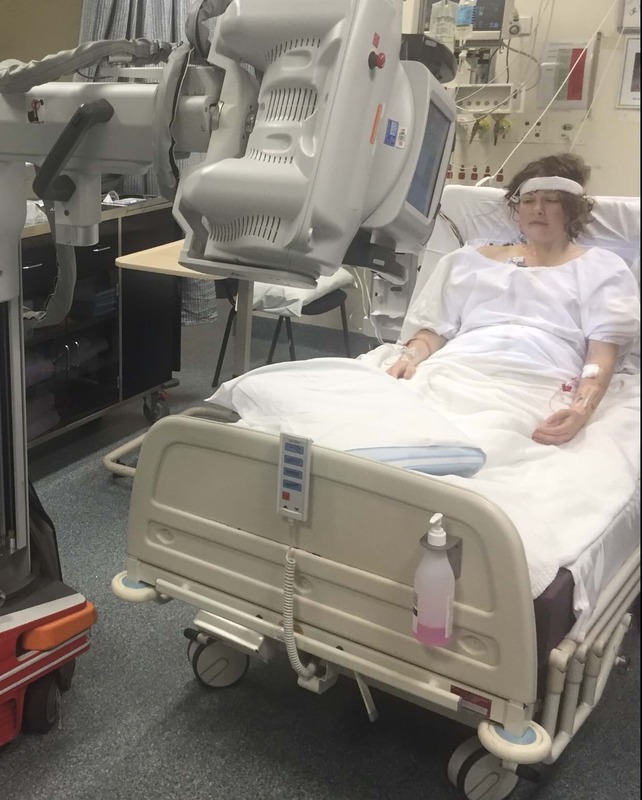 I lost count with the amount of doctor’s visits, scans, blood test, even hospital visits made from then until I was 26 – when I was FINALLY given the official diagnoses “You have Stage 4 Endometriosis”. 11 years it took me to get an answer to what caused the pain and fatigue. This also effected my mental health, I thought I was crazy, and it was ‘all in my head’. My Mum and Aunties both had it. I’ve lost count of the amount of surgical procedures I’ve endured and don’t even get me started about the medical bills. My story is like the hundreds of thousands of Endo Sisters suffering. I am extremely passionate about raising awareness and research for this illness and am a proud ambassador for Endometriosis Australia. The most frustrating thing about this condition is I don’t look sick. You can’t see the damage it has done to my uterus, bowel and kidney (nor would you want too!) The only way to be officially diagnosed is via laparoscopic surgery. Treatment wise there are some medications and complimentary medicine like acupuncture that may help with pain however THERE IS NO CURE. Saturday March 30th National EndoMarch High Teas are happening across Australia. I am honoured and so excited to be hosting the Canberra event at the Hyatt Hotel. This afternoon is all about raising funds for research, education and creating awareness for Endometriosis. You receive a glass of bubbles on arrival, the incredible kitchen at the Hyatt will tantalize your taste buds with some of the BEST High Tea food in Australia, plus you will hear from some very special guests. I have the secret inside word who will be attending, and trust me, you do not want to miss this. Food + Bubbles + Fun + Prizes + Helping those with Endo = a great afternoon in Canberra. Get together your bestie, bring your group, partner, work mates or family and grab your tickets now. I can’t wait to meet you and have a glass of bubbly. All money from ticket sales goes to Endometriosis Australia, get grabs yours, by clicking here. 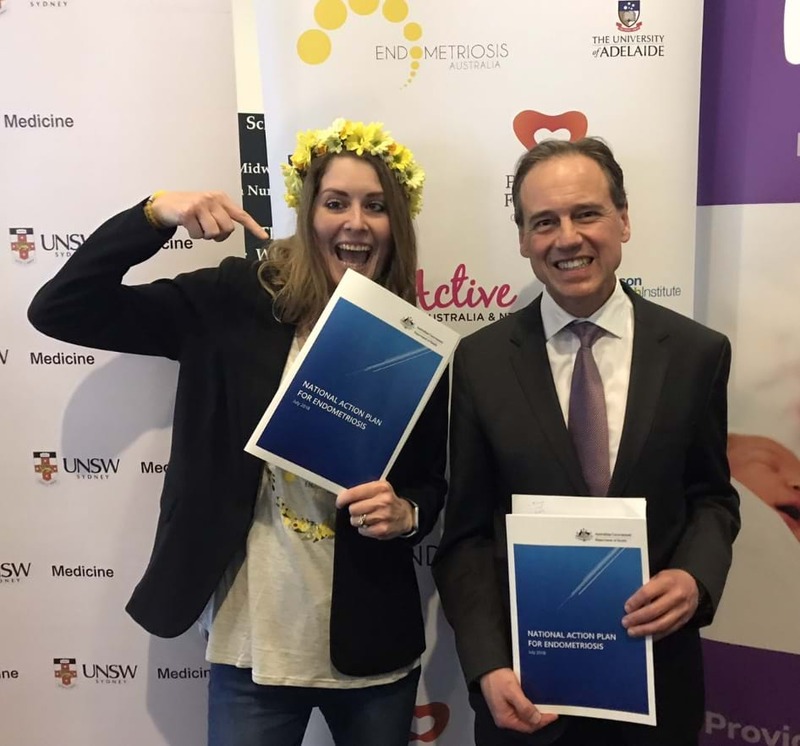 (Ellie with Health Minister Greg Hunt on the launch of the National Action Plan for Endometriosis granted by the Australian Government).